Twelve-year-old Aru Shah has a tendency to stretch the truth in order to fit in at school. While her classmates are jetting off to family vacations in exotic locales, she'll be spending her autumn break at home, in the Museum of Ancient Indian Art and Culture, waiting for her mom to return from their latest archaeological trip. Is it any wonder that Aru makes up stories about being royalty, traveling to Paris, and having a chauffeur? I've been curious about writer Rick Riordan's new book imprint since I first read about it, so am very pleased to be able to get on in the ground floor, as it were. The well-known mythology writer wanted to give a platform to writers from underrepresented cultures and backgrounds, to present their own histories and traditions in their own words. It's the ultimate in Own Voices, as Riordan recognizes that he's not the best person to bring stories to life that lie outside of his own heritage. 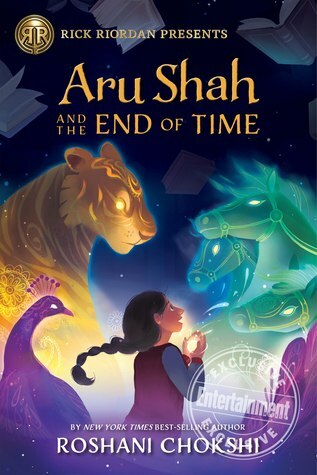 Aru Shah and the End of Time from Roshani Chokshi is the first release from that imprint, and it absolutely doesn't disappoint. This book is the sweetest story about friendship, perseverance, and also epic adventuring that I've read in ages. Aru Shah is a fantastic lead character to take the reader through her adventures. She's just a regular 12 year old, worried about fitting in and being liked at school, being sad when her mom doesn't pay attention to her or blows off things they were supposed to do together. Aru's grown up in the museum that her mom runs, and her adventures finally kick off when she gets caught up in one too many embellishments on the truth with her classmates. Aru's adventure is unexpected, both to Aru and to everyone she encounters. She's just a little girl, how is she the reincarnation of a Pandava, a set of legendary brothers? Every step of the way, Aru has to fight against people who underestimate her and don't believe in her. And while sometimes her confidence may waver, she has delightful companions in her quest -- including a more-than-meets-the-eye pigeon and her newly minted sister Mini, whose tendencies to worry and panic are the flip side of Aru's headstrong nature. The quests and riddles that Aru and Mini have to solve along the way are very clever, and while of course you know they'll be successful, there are lots of moments where you wonder just how they're going to get out of the situation they've found themselves in. The book is highly engaging, even to this very-much-not-middle-grade reader. I read most of it in one sitting and every time I had to put it down, I was disappointed that I couldn't keep reading. There are lots of cultural/timely references that middle grade readers might slide past, but any adult who does a read-along or picks this up for themselves will find themselves chuckling quite a bit. As someone who knows absolutely nothing about Indian mythology, all of the players in this book were new to me. The gods and goddesses were introduced organically, and the explanations of their backstories is handled seamlessly in a way that doesn't feel like too much information is being dumped on readers. There's also a very handy glossary at the end giving you a run-down of all the characters and concepts you come across. This book is the first in a series, and the end clearly sets you up for the next book, but I wouldn't say this is a cliff-hanger. There are still some unresolved loose ends, but the main plot wraps up nicely enough. No matter your age, you can find something to enjoy and reflect on in this story. Chokshi's writing style is simple and fresh, and the love and care she has for her original characters and for telling a story steeped in the rich world of Indian mythology comes through loud and clear on every page.